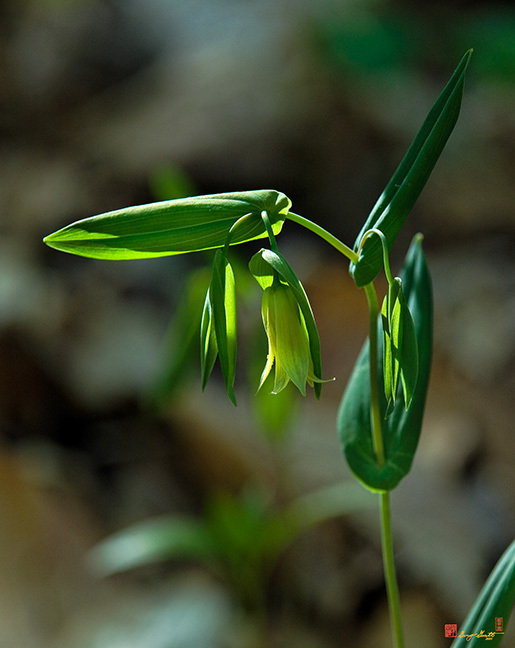 2006 Photograph, Perfoliate Bellwort Flower (Uvularia perfoliata, Lily family), named for their bell-like flowers. Fairfax Villa Park, Fairfax, Virginia, © 2014. This species has a single bell-like flower at the tip of forking stems. The stem appears to pierce the leaf and the inside of the flower is rough with orange grains. Moist woods, Ontario and Quebec, south, blooms May-June.